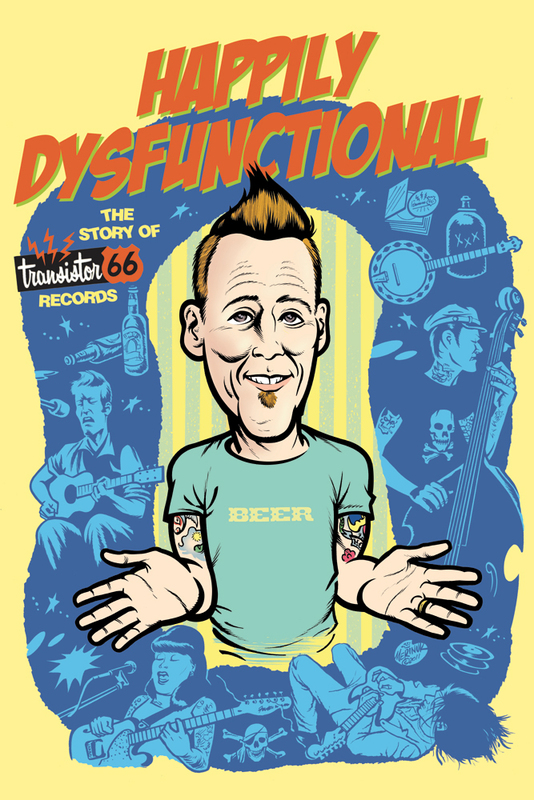 Here's my first ever movie poster design, done for the recent documentary Happily Dysfunctional, The Story Of Transistor 66 Records featuring all the frantic facts and rumors about Winnipeg's one and only rock'n'roll record label. 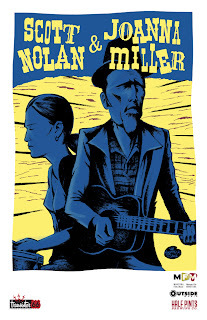 The film has been playing on public access cable here in Winnipeg and is also available on DVD with the above poster as cover art. I'm sure it will be up on the internet at some point if it's not already. Stay tuned for MORE ACTION! Since the blockbustin' 50th issue of Roctober is soon to hit the stands I guess it is time to share this little epic which appeared in issue #49. Stay tuned for MORE ACTION! 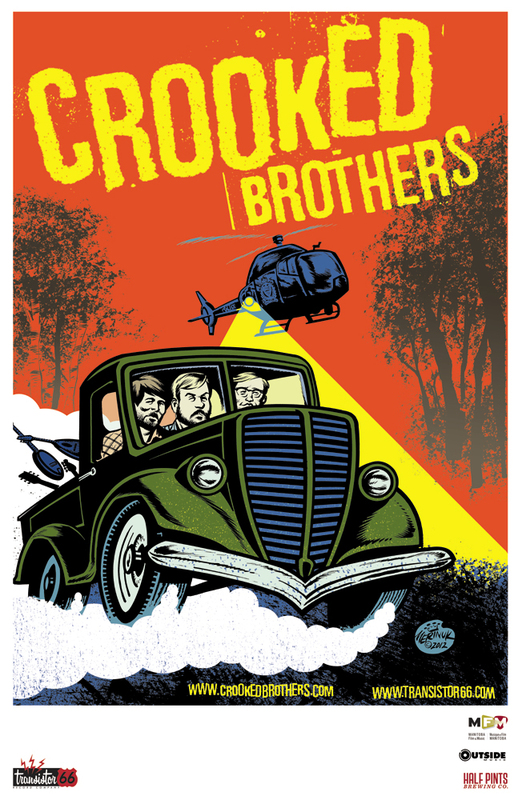 Here's a poster I did recently for an upcoming US tour by Winnipeg roots rocker Scott Nolan. I tried some different things on this one so it is not quite my usual trashy style. Stay tuned for MORE ACTION! 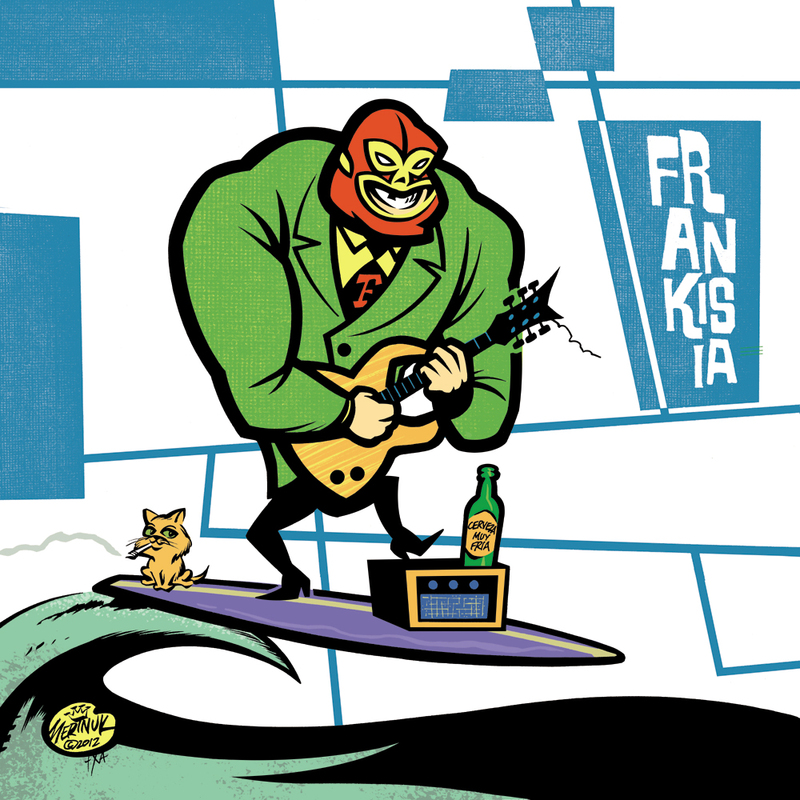 Here's the cover art for the upcoming demo EP by kool Mexican surf combo Frankisia. Aside from a blast of Lucha Libre rock'n'roll action, this drawing features the debut of my new character creation that will soon be sweepin' the nation, the Smoking Kitten. Keep eyes peeled for a vast wave of tacky merchandise featuring this adorable feline nicotine addict. (Smoking Kitten © King Merinuk 2012, all rights of any kind reserved forever.) Stay tuned for MORE ACTION! The last thing I finished in 2011 was this logo for a new rock'n'roll label outta France called Howlin' Banana Records. 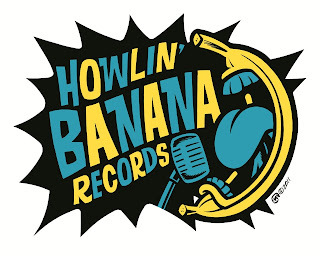 Should be some cool 7"ers out real soon bearing this logo so keep an eye out for 'em. Stay tuned for MORE ACTION! 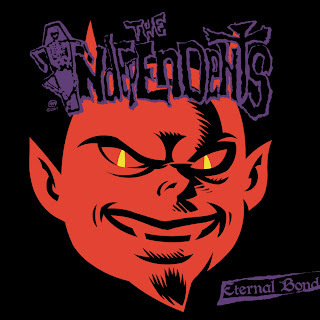 Back in 2005 I did the art and layout for the Eternal Bond CD by my old pals The Independents. 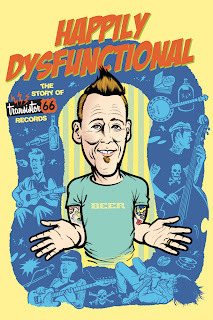 This year the album is making its debut on vinyl so I was called upon to revise and update the original sleeve design and here be the result. My first idea was to do a major reworking of the original front cover design which you can see below. We finally decided to use something much closer to the CD version for the LP sleeve but the revised devil head art will be used on stickers and T-shirts. Stay tuned for MORE SATANIC ACTION! 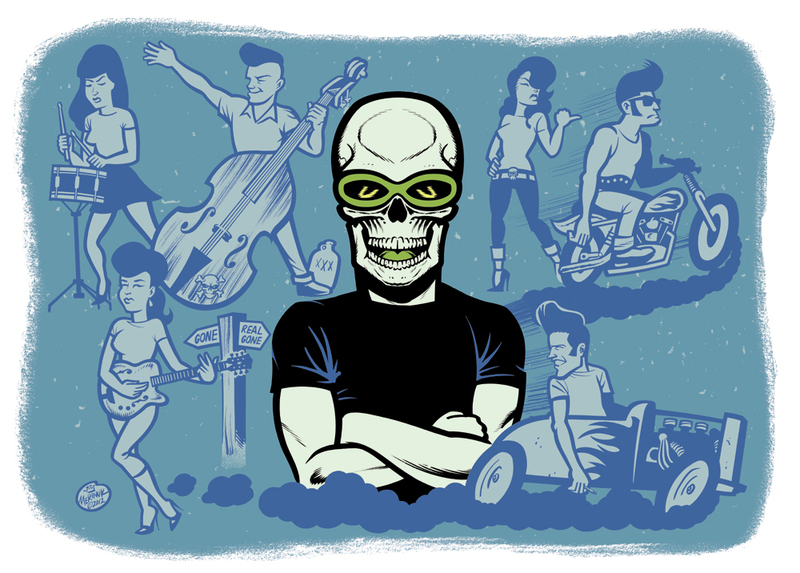 Here's a bit of advertising art I just put together for my old pal Nick Rawkahula's suave line of hot rod/rock'n'roll action wear. The ad will be printed with Rawkahula shirt designs and info superimposed over the drawing but here you get the art in its raw form. 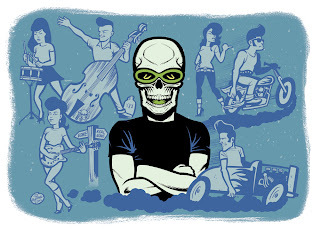 I'm workin' on 5 new record sleeve designs right now so lotsa new stuff will be posted here soon. Stay tuned for MORE ACTION! Gotta bunch of new stuff to post up in the next few days. To kick things off here's the European tour poster for Winnipeg country/roots combo Crooked Brothers featuring a guest appearance by the ubiquitous Winnipeg Police helicopter. Lots more coming soon so... Stay tuned for MORE ACTION!